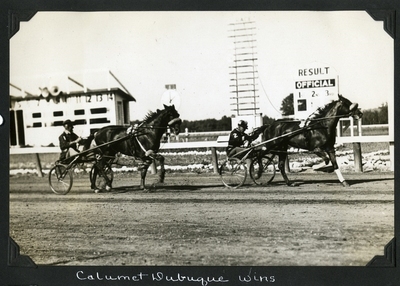 Black and white, finish line photo of Calumet Dubuque winning a heat of the Two-Year Olds Pace at the Grand Circuit Meeting at Rockingham Park, Salem, N.H. on Friday, August 5, 1932. Calumet Dubuque is being driven by E. Pitman. The second-place finisher is black colt, Logan Scott, W. Britenfield up.